Intended for unsatisfactory purchases, this product complaint letter notifies a retail company that the item does not work. 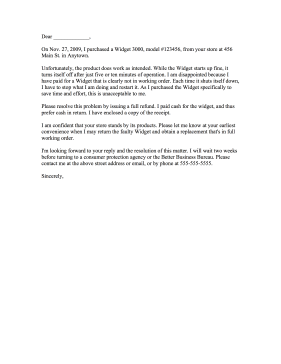 On Nov. 27, 2009, I purchased a Widget 3000, model #123456, from your store at 456 Main St. in Anytown. Unfortunately, the product does work as intended. While the Widget starts up fine, it turns itself off after just five or ten minutes of operation. I am disappointed because I have paid for a Widget that is clearly not in working order. Each time it shuts itself down, I have to stop what I am doing and restart it. As I purchased the Widget specifically to save time and effort, this is unacceptable to me. Please resolve this problem by issuing a full refund. I paid cash for the widget, and thus prefer cash in return. I have enclosed a copy of the receipt. I am confident that your store stands by its products. Please let me know at your earliest convenience when I may return the faulty Widget and obtain a replacement that's in full working order. I'm looking forward to your reply and the resolution of this matter. I will wait two weeks before turning to a consumer protection agency or the Better Business Bureau. Please contact me at the above street address or email, or by phone at 555-555-5555.